Brilliant orange or sulphur yellow flowers with an arresting dark eye make the beetle lily, Baeometra uniflora, instantly recognizable. This bulbous plant is endemic to the southwestern Cape and its readiness to colonize road verges and lawns making it an attractive subject for cultivation. Baeometra uniflora is a deciduous geophyte up to 300 mm high, with a flattened, ovoid corm covered in dark brown, leathery tunics. Leaves 5-8, mostly basal in a fan, narrow, channelled, clasping the stem at the base. Flowers 1-5, suberect, funnel-shaped, shortly pedicellate, bracts thread-like or awl-shaped, successively smaller and the uppermost flowers without a bract, unscented. 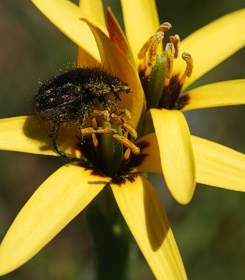 Tepals free, ± erect below and flaring above, yellow to orange with a dark maroon base, flushed red on the reverse, oblanceolate, 15-28 mm long and narrowed below into a claw 3-12 mm long, abscising after flowering. Stamens inserted at the top of the claw, filaments dark maroon, ± 3 mm, anthers yellow, 2-4 mm long. Ovary cylindrical and 3-lobed, 7-10 mm long with 3 short, hooked styles ± 0.5 mm long. Fruit a woody, cylindrical, 3-lobed capsule, 30-50 mm long, dehiscing only at the top and splitting along the joins between the lobes (i.e. septicidal). Flowering time: August to October. The species is relatively commonly encountered on clay or loamy soils in the southwestern Cape, from near Tulbagh eastwards to Riversdale. Plants favour open, seasonally damp or waterlogged situations and are often found in areas of slight disturbance such as road verges, along paths, and in meadows. The flowers close up at night or in dull weather and only open fully in bright sunshine, when their brilliant colour and contrasting dark eye are striking. The species is typically found at lower altitudes in moist temperate situations and in its native habitat seldom or never experiences frost during the growing season. The genus Baeometra was described by Salisbury (1812), derived from the Greek baios, small, and metron, measure, referring to its size. He erected the genus for a single species that he named Baeometra columellaris (referring to the columnar ovary), evidently unaware of the fact that the species had in fact already been named. The earliest reference to the species is the beautiful coloured plate by the Austrian botanist and artist Nicholas Jacquin, who had figured the species in 1793 under the name Melanthium uniflorum. This name was largely ignored until 1941, when the South African botanist Gwendolyne Joyce Lewis correctly identified it as the earliest available epithet for the species. Baeometra is a member of the family Colchicaceae, which comprises ± 15 genera and ± 225 species and is widespread around the world, mainly in areas with a Mediterranean climate. The family is closely allied to the Alstroemeriaceae. 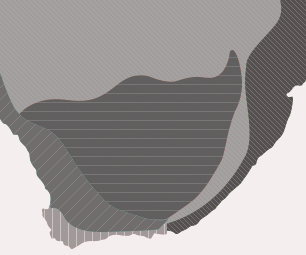 Baeometra still comprises just a single species restricted to the southwestern Cape. It was until recently treated in its own tribe Baeometreae on account of its spike-like raceme with reduced bracts, which appeared to be intermediate between the bractless spikes of the other southwestern Cape genera and the leafy racemes of the rest of the family. Recent DNA analysis has shown that Baeometra is most closely related to the genus Wurmbea (including Neodregea and Onixotis), from which it differs most noticeably in its several (never only three) leaves, bracteate raceme, and lack of nectaries on the tepals. These two (or more) genera are now treated as the tribe Anguillareae. Baeometra, like all related members of the family with corms, is adapted to seasonal drought. In nature, plants sprout in winter with the onset of the rainy season, coming into flower in spring. The flowers are sensitive to temperature and only open fully on warm, sunny days. Each lasts just a few days, after which the tepals drop off to expose the rapidly enlarging ovary. The fruits mature slowly and are ready to shed seeds only in late summer. Like most members of the family, the woody capsules split open along the joins between the three compartments or locules, only opening at the top of the capsule. Seeds are thus shed slowly over a long period of time as the dry stalks are shaken by the summer winds. 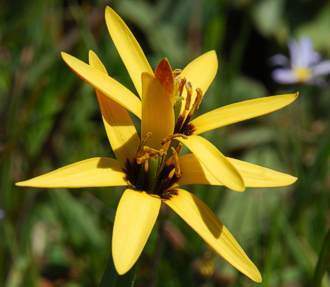 The bright yellow flowers with dark eye resemble in their colour and marking those of several other bulbs in the southwestern Cape, especially Ixia maculata (Iridaceae) and Ornithogalum dubium (Hyacinthcaeae). These flowers are all adapted to pollination by furry monkey-beetles, which are drawn to the dark centre by its resemblance to a potential mate. Although I have seen beetles visiting the flowers, the species appears to be self-fertile as all fruits invariably develop fully. Although not specifically identified as such, Baeometra, like other members of the family is almost certainly poisonous. Despite its attractive appearance, the species is poorly known in horticulture and I can find no evidence that it has been used medicinally. In fact it lacked a recorded common name until I coined the name beetle lily. Treat as for other Mediterranean bulbs. The species is frost-tender and should be grown under cool temperate conditions, with a moist winter growing season and pronounced summer dormancy. It is amenable to pot culture but in cooler climates may be grown in summer in a border, to be lifted in autumn. Water plentifully during growth but withold water after flowering to allow the plants to enter summer dormancy. Plants set plentiful seed, which should be sown in autumn (March in the southern hemisphere). Cultivate in a bright situation in well-draining sandy loam. In the Western Cape the species should naturalize well in wild places in the garden and I know of yards where they have colonized unkempt grassy areas away from extreme cultivation and watering. I do not see why it should not thrive in similar situations elsewhere where suitable climates or conditions exist, especially in rockeries where drainage is good. Bryan, J. & Griffiths, M. 1995. Manual of bulbs. Timber Press, Oregon. Vinnersten, A. & Manning, J. 2007. A new classification of Colchicaceae. Taxon 56: 171-178.